Vatican City (Agenzia Fides) – There are thirty-three members of the National Directions of the Pontifical Mission Societies (PMS), from 17 francophone countries of Africa, America and Europe, who are participating in Rome, guests at the International Center for Missionary Animation (CIAM ), in the formation course in view of the Extraordinary Missionary Month of October 2019. Organized by the PMS International Secretariats and CIAM, the course takes place from 1 to 6 April, and was inaugurated by Archbishop Giampietro Dal Toso, President of the Pontifical Mission Societies, with a broad theological report on the theme "The mission of the Church and the PMS". Two questions were raised at the beginning of his speech: "Why is the Church missionary? What does mission mean today". "The missionary mandate comes from Jesus himself, at the end of his earthly existence - underlined the Archbishop -. Therefore it continues to be an absolute priority for all the baptized, since they are part of the Church. The mission of evangelization that the Church has received from Christ is called to take shape in time and space, in a concrete place, to reach concrete populations, visible and palpable human beings". "This is the heart of our mission as PMS", highlighted Mgr. Dal Toso, who then went on to illustrate their "charismatic service" at the service of the mission. In one sentence, the four PMS constitute "a worldwide network at the service of the Holy Father to support the mission and the young Churches through prayer and charity". In a recent video "the Pope himself states that the PMS are important, but not very well known". 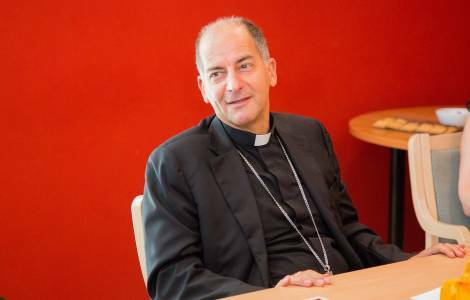 "It is also my personal experience", the Archbishop commented. Continuing his speech, Mgr. Dal Toso recalled the specific purposes for which the PMS were founded, their founders, the references of missionary teaching, illustrating their structure and charisma. The President of the PMS then highlighted five areas of activity of the PMS at a national level: to keep the missionary spirit alive through animation and missionary formation; to encourage prayer; to cultivate missionary formation; to encourage the collection in particular for World Mission Day; to collaborate with Agenzia Fides, the information body of the PMS. In the second part of his speech, Mgr. Dal Toso focused on some theological principles that are the basis of missionary work. Starting from the "Church as a sacrament" and from the various images offered by the conciliar Constitution Lumen Gentium, he went on to talk about the relationship between the local Church and the universal Church, united by the missionary task: "two distinct but not separate realities", such as the PMS, which in turn are universal and local. The third theological horizon touched the relationship between faith and mission ad gentes. Finally the link between baptism and sending, which is the theme of the imminent Extraordinary Missionary Month. "The Holy Father has chosen this theme which includes the essential elements to be taken into consideration in the planning and implementation of this initiative - said Mgr. Dal Toso -. Baptized and sent: in baptism we received the divine life, thanks to which we are prophets, that is, heralds of the mystery of Christ, sent by him. The Christ who sends us is also the essential content of the mission: the Church transmits the message she received from Christ, that is, her own person". In the conclusion of his speech, the Archbishop reiterated that "as the Church is missionary by nature, therefore the mission is ecclesial by nature, because it extends in the concreteness of human experience, the action of Christ who always passes through concrete people. For us baptized Christians ... it is a question of bearing witness to Jesus, letting his presence shine through us, so that his face may be revealed and be accessible to all men and women".